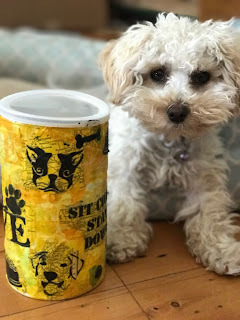 When I created this Dog Stencil and Mask for Stencil Girl Products, I knew I had to make something for my little puppy, Nimby. 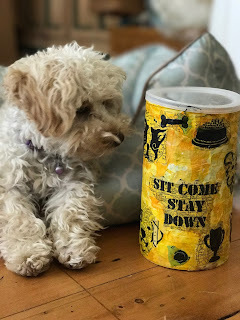 She spends all day with me in her studio, so I thought she deserved a mixed media dog treat container. 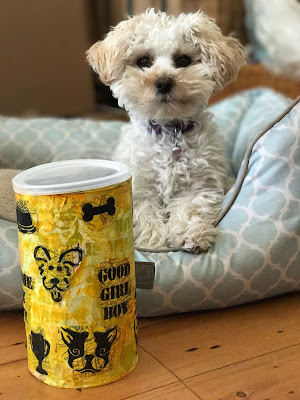 She only weighs 5 pounds, so her dog treats are very tiny. I decided to repurpose a coffee bean container to hold her tiny biscuits! You can also watch "Create a Cute Dog Treat Container" on YouTube. Both Nimby and I are very happy with how the container came out! GIVEAWAY ALERT! I hope this video sparks your creativity! 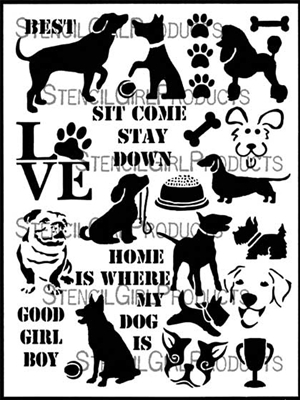 Leave me a comment and let me know if you'd like to win a Dog Stencil and Masks for your very own! I'll announce the winner next Tuesday. I would love to win a dog stencil and mask. Even if no corgi is included in the stencil. Lol. Nimby is adorable. This is such a cute idea! Would love to do something similar for my two grand pups! Would look so cute on my daughter's kitchen counter! Would love to win as i could make presents for all my yellow labs friends from the field walks.you have covered them all in one stencil.